People on Earth (2016) : Série TV de 1 saisons et 10 épisodes diffusée sur TBS. Casting, acteurs, bandes annonces et actualités. 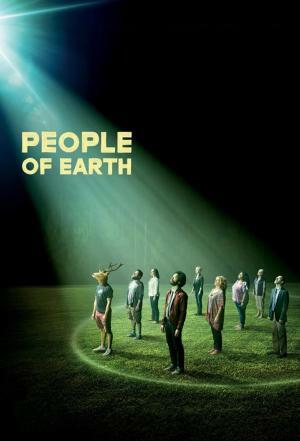 Casting de la série "People on Earth"
S01E01 Pilot 31/10/2016 Things get weird for journalist Ozzie Graham after a suspicious car accident sends him searching for answers at StarCrossed, a support group for alien experiences. S01E02 Sponsored By 31/10/2016 Trying to win over Ozzie, Gerry goes above and beyond what a good sponsor would do; Chelsea opens up to Father Doug about her marriage; tensions run high as Jeff, Don and Kurt prepare for the alien invasion. S01E03 Acceptance 07/11/2016 Ozzie helps Richard face his broken marriage; Yvonne and Gerry investigate a mysterious cover up; Jonathan Walsh delivers some upsetting news to Jeff and Don. S01E04 Past, Present and Future 14/11/2016 Ozzie's former boss, Jonathan Walsh, makes a surprising visit to Beacon; the origin of StarCrossed is revealed as Gina takes a trip down memory lane. S01E05 Unexplained 21/11/2016 Unexplainable visions and hallucinations have Ozzie thinking he's losing his mind; Chelsea and Father Doug connect through Bible study; Kelly continues to struggle with relationships. S01E06 Significant Other 28/11/2016 Ozzie and Father Doug have a night out; Gina holds a coming out event for the members of StarCrossed; Jeff makes a connection with a stranger in an online chat room. S01E07 Last Day on Earth 05/12/2016 Gerry says goodbye to StarCrossed as he readies for his own long-awaited experience; Jonathan Walsh shares game changing information with Ozzie; Don and Kelly go on a date. S01E08 Mars or Bust 12/12/2016 Ozzie makes a surprising confession during an interview; Father Doug has an experience; Jeff is determined to find Kurt's killer. S01E09 Lost and Found 19/12/2016 Ozzie leaves Beacon hoping to return to a normal life; Chelsea goes on the road with Operation Mongoose; the members of StarCrossed contemplate an uncertain future. S01E10 Snake Man and Little Guy 19/12/2016 Ozzie has a significant breakthrough; Jeff and Jonathan Walsh square off before the impending invasion; the members of StarCrossed struggle to find meaning after the group's break-up. Envie de parler de People on Earth ? Les discussions sont là pour vous. Retrouvez toutes les informations sur People on Earth lancée en 2016 : synopsys, casting complet, acteurs, scénariste, réalisateur. Découvrez des séries similaires à regarder également. Faites vous une idée de la série grâce à la note des membres et aux critiques des internautes.